Published on Monday, November 28, 2016. This article appears in the October/November 2016 issue of American Craft Magazine. 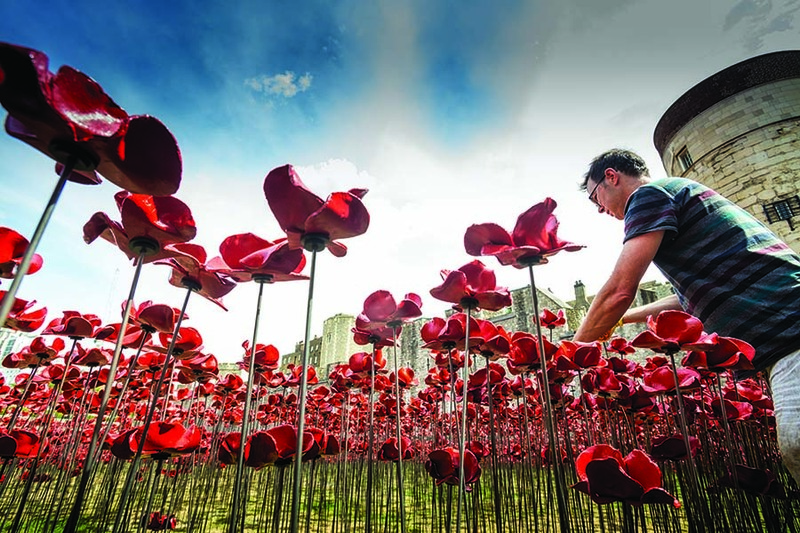 A line in a soldier’s will inspired British artist Paul Cummins’ 888,246 ceramic poppies – one for each British and colonial military death in World War I. 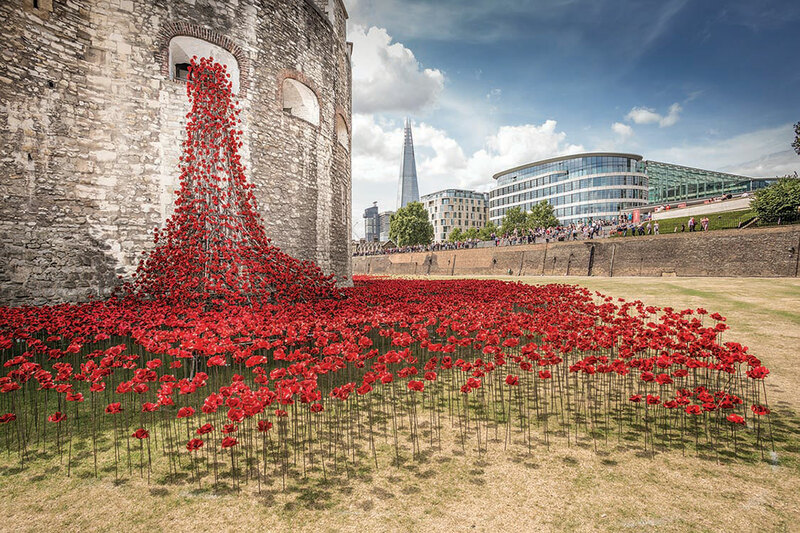 On view for four months in 2014, Blood Swept Lands and Seas of Red spilled across the Tower of London’s moat to mark the 100th anniversary of the war’s outbreak. As volunteers gradually planted the clay blossoms over the months, the installation’s impact grew one flower at a time. 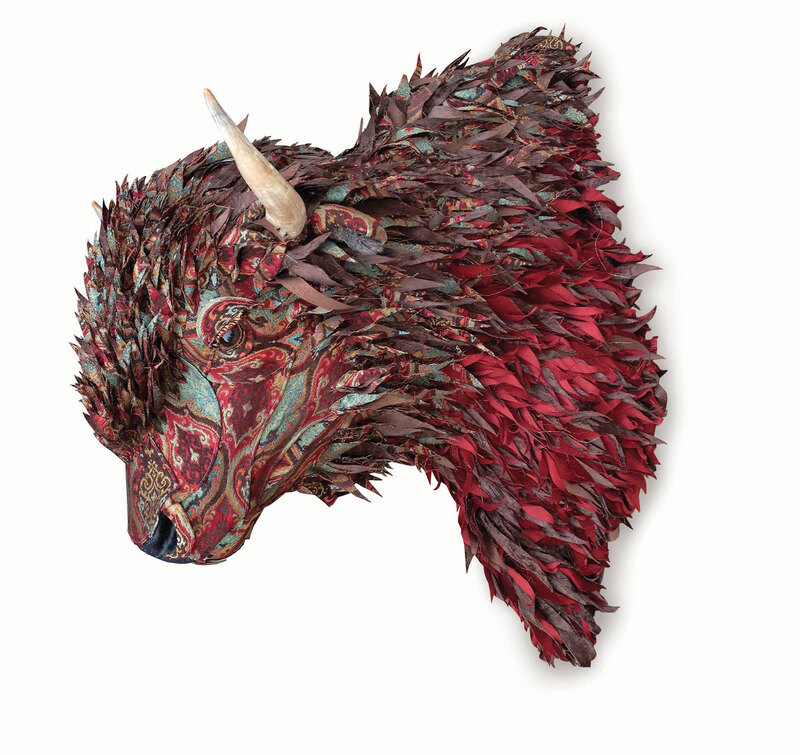 Wisconsin artist Kelly Rene Jelinek takes the gore out of hunting trophies yet keeps them anatomically correct. Her detailed and fantastical creatures – built with traditional foam mounts, glass eyes, and an array of fabrics rich with pattern and texture – marry magical, fairy-tale imagery with the art of taxidermy. The 2015 FIFA case, where 14 members of the world soccer organization were charged with fraud and racketeering, rocked sports fans worldwide. 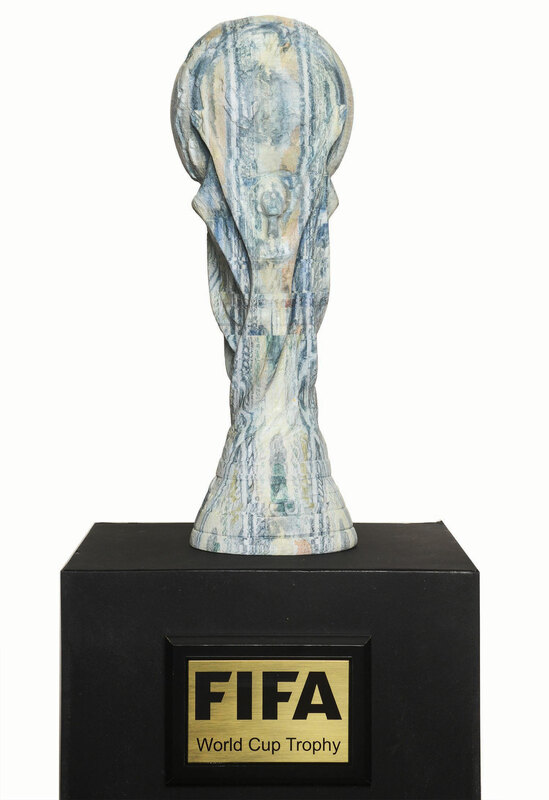 London-born LA street artist Plastic Jesus responded by carving faux $100 bills into a FIFA World Cup trophy. Assembled from individually cut notes totaling $2.8 million, it’s the ultimate prize for a corrupt official. Jaydan Moore marks the changing meaning of heirlooms as they pass from one generation to the next. For his Platter series, the North Carolina metalsmith takes apart different found and donated trays, then merges the pieces into exquisite forms uncannily reminiscent of the originals. Made from metal marked by wear, his works carry the history of their past lives, now ingrained with new meaning. 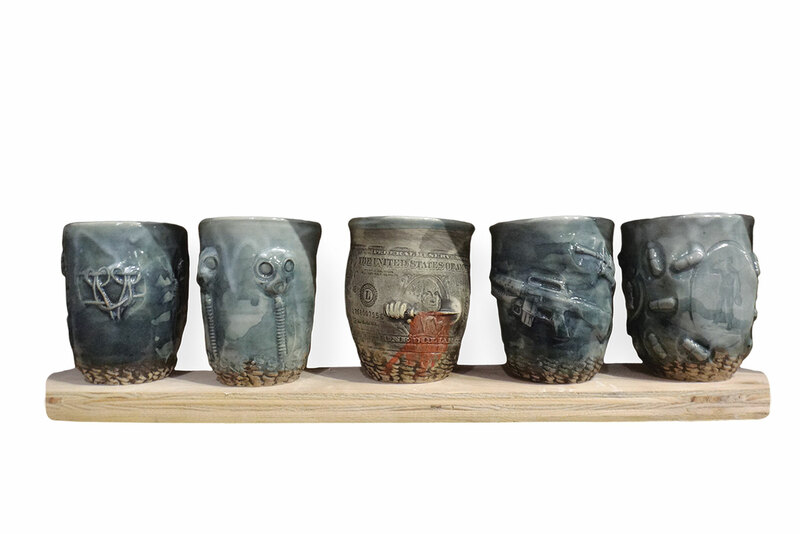 Amsterdam artist Vika Mitrichenko, who hails from the former Soviet Union, makes Trophy Cups to celebrate the mundane, unsung moments of her father, a former swim coach for the Soviet national team. 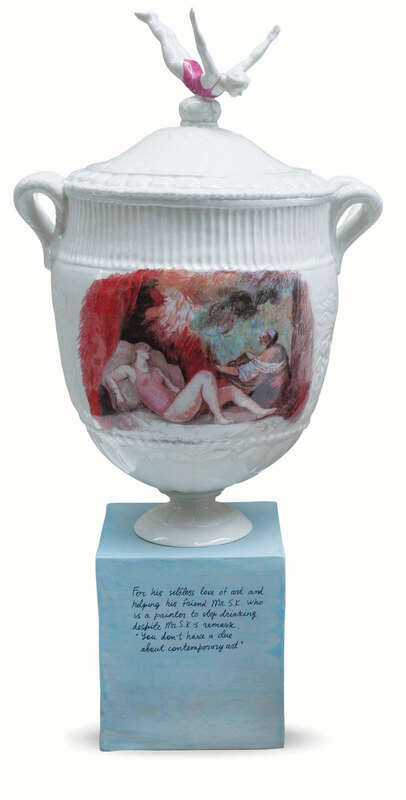 While these small, sometimes absurd, deeds would otherwise go unnoticed, the tender inscriptions painted on porcelain trophies raise them to a new level of significance. Ceramist Ehren Tool, a veteran of the first Gulf War, uses the cup to explore the cost of armed conflict. Its unassuming form, which he embeds with images of violence found throughout popular culture, helps open up difficult conversations as it travels from hand to hand. In a humble effort to translate the abstraction of war into something tangible, Tool has created and given away an unfathomable number – more than 17,000 since 2001.